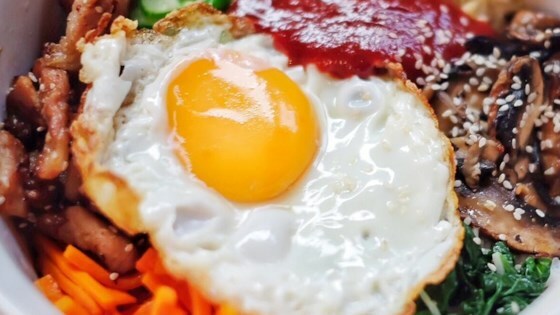 "Along with kimchi, bibimbap takes its place among the favored foods in Korean cuisine. Literally meaning 'mixed rice,' it's a popular meal consisting of white rice topped with vegetables, beef, a whole egg, and gochujang (red chili pepper paste). For those who cannot handle the spiciness (like our children), you can substitute with soy sauce or Sriracha (rooster sauce) in place of it." Stir cucumber pieces with 1/4 cup gochujang paste in a bowl; set aside. Bring about 2 cups of water to a boil in a large nonstick skillet and stir in spinach; cook until spinach is bright green and wilted, 2 to 3 minutes. Drain spinach and squeeze out as much moisture as possible; set spinach aside in a bowl and stir soy sauce into spinach. Heat 1 teaspoon olive oil in large nonstick skillet and cook and stir carrots until softened, about 3 minutes; stir in garlic and cook just until fragrant, about 1 more minute. Stir in cucumber pieces with gochujang paste; sprinkle with red pepper flakes, and set the mixture aside in a bowl. Brown beef in a clean nonstick skillet over medium heat, about 5 minutes per side, and set aside. In a separate nonstick skillet, heat 1 more teaspoon olive oil over medium-low heat and fry the eggs just on one side until yolks are runny but whites are firm, 2 to 4 minutes each. To assemble the dish, divide cooked rice into 4 large serving bowls; top with spinach mixture, a few pieces of beef, and cucumber mixture. Place 1 egg atop each serving. Drizzle each bowl with 1 teaspoon of sesame oil, a sprinkle of sesame seeds, and a small amount of gochujang paste if desired. After the number of very positive reviews, I was disappointed at how bland this dish was. My wife and our brunch guests had the same response. I followed the recipe very carefully. It's only as good as the gochujang you use! It's a great recipe and also authentic. The sauce for bibimbap could be a key to make the dish delicious. This is excellent, very much like the real thing. I used pork marinated and cooked in Korean Barbeque sauce.